Enjoy a taste of Mediterranean olive oil goodness with Bertolli. Contains 74% less saturated fat than butter. Rich in monounsaturated fat, Bertolli spreads are a perfect alternative to butter. Suitable for vegetarians and contains no artificial colours and flavours. 59% vegetable fat spread with 21% olive oil. Enjoy food the Italian way. Olive oil is at the heart of the Italian kitchen and has always been at the heart of our Bertolli recipe. Bertolli spreads have been enriching mealtimes since 1865 Choose Olive Oil goodness as part of a healthy lifestyle Enjoy the rich buttery taste of Bertolli spread as part of an active lifestyle and healthy diet. Bertolli original spread is lower in saturates than butter Replacing saturated fat with unsaturated fat in the diet contributes to the maintenance of normal blood cholesterol levels (monounsaturated fatty acids are unsaturated fats). Olive oil and monounsaturated fat are components of a healthy lifestyle. Enjoy the delicious buttery taste of Bertolli spread as part of a healthy diet and lifestyle. Bertolli spread contains olive oil and monounsaturated fat. These are components of the traditional Mediterranean diet, which is amongst the healthiest diets in the world. Bertolli is committed to sustainable palm oil. Margarines contain 80% fat, whereas Bertolli spreads contain less than 80% fat and are therefore classified as vegetable fat spreads. 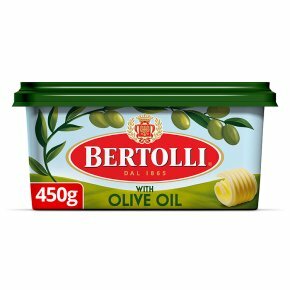 Produced outside of Italy with Olive oil Bertolli original is suitable for spreading, baking, topping and frying. Bertolli spread contains no artificial colours and flavours.